Dr. Yarlagadda is Chief, Behavioral Health Services, McDonald Army Health Center in Newport News, Virginia, and Assistant Professor, Department of Psychiatry and Neurobehavioral Sciences, University of Virginia, Charlottesville, Virginia; Dr. Rosenblatt is Adjunct Associate Professor, UT Health at Houston, Department of Internal Medicine, Division of Oncology, Houston, Texas; and Dr. Clayton is Professor, Department of Psychiatry and Neurobehavioral Sciences, University of Virginia, Charlottesville, Virginia. Financial Disclosures: Dr. Rosenblatt is a founder, employee, and Lab Director, CMO, CSO for Companion Dx Reference Lab, Houston, Texas. Drs. Yarlagadda and Clayton have no conflicts of interest relevant to the content of this article. Abstract: The rate of completed suicides continues to rise across nations, cultures, socioeconomic classes, age groups, sexes, military personnel, veterans, and civilians from different backgrounds. Most concerning is the absence of diagnosed mental health disorders in the majority of these cases, per current literature reports. Efforts in the identification and possible prevention of this ultimate, tragic act of self-destruction have been minimally successful. In this article, the authors discuss the possible biological mechanisms including the role for potential markers, single nucleotide polymorphisms (SNPs), and their association with suicidal behaviors. Single nucleotide polymorphisms (SNPs) are commonly associated with pharmacogenomics (the study of the role of genetics in drug response) and personalized medicine, and are mediated, at least in part, by P450 enzymatic activity in the liver, impacting different genotypes and their corresponding phenotypes. So far, pharmacogenomics has led to significant progress in our understanding of the mechanisms of drug actions and the different pathways in which psychotropic medications are metabolized. Pharmacogenomics, therefore, has the potential to improve treatment outcomes. Recent scientific advances, however, have broadened the scope of SNP function to encompass cognitive activity in the central nervous system. This extension of SNP function to the brain is novel and provides insight into a comprehensive approach to a better understanding of neuropsychiatric conditions. A thorough understanding of the underlying endogenous processes is essential prior to exploring the impact of the introduction of exogenous compounds, such as psychotropic medications. SNPs are known to have existed for millennia as the so-called defective CYP genes, having been identified in Neanderthal genetic sequences. The two most common cytochrome P450 polymorphisms that are the focus of pharmacogenomics are CYP2D6 and CYP2C19. Increasing evidence points to the presence of these two polymorphisms in brain tissue as well, extending the possibility of comprehensive organ system involvement beyond the liver. Thus, exogenous introduction of psychotropics could interfere with the endogenous cellular mechanisms involved in biotransformation and eventual production of neurotransmitters, or neurons. Formation of neurotransmitters involves the oldest of organic reactions—decarboxylation—with the participation of a myriad of complicated molecules including cofactors, hormones, enzymes, signaling molecules, and second messengers, collectively termed “CHESS” as shown in Figure 1. Subsequently, the mechanism of transamination involves the breakdown or metabolism of neurotransmitters with the byproducts circulating via blood and cerebrospinal fluid (CSF). Both chemical reactions are significant in the role of SNPs and their respective phenotypes, such as poor metabolizers (PMs), extensive metabolizers (EMs), intermediate metabolizers (IMs), rapid (RMs), and ultra-rapid metabolizers (UMs), in the breakdown of neurotransmitters. The prevalence of SNPs can be quite variable, with inter-individual and inter-ethnic differences dictating the rate of metabolism of different P450 substrates. For example, 10 to 15 percent of Caucasians are phenotypically intermediate metabolizers for CYP2D6, compared to the 6 to 8 percent who are poor metabolizers and 5 to 10 percent who are ultra-rapid metabolizers.6 In the case of CYP2C19 phenotypes, 3 to 5 percent of Swedish, 20 percent of Japanese, and as high as 79 percent of the inhabitants on the island of Vanuatu in the Pacific Ocean are poor metabolizers. 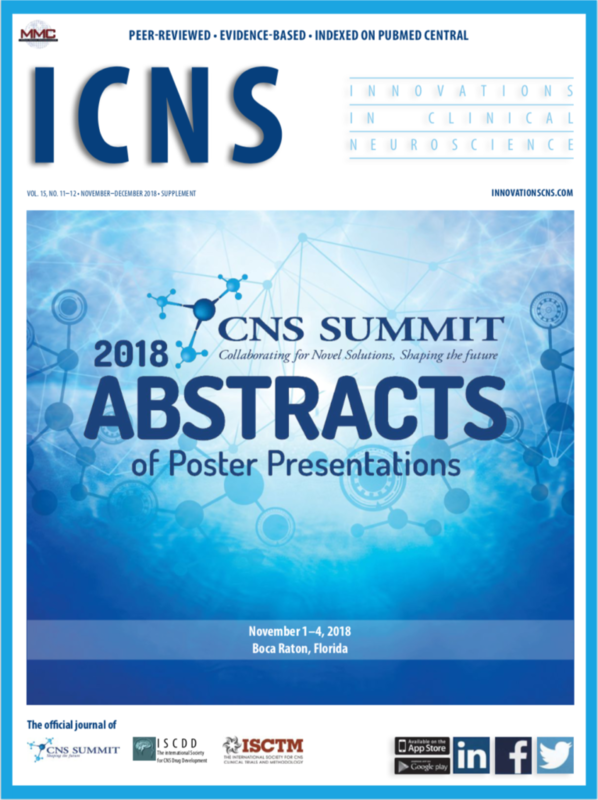 Recognition of an association between SNPs and cognition is relatively new, although more studies are emerging that suggest this link might be a potential signal in the early detection and treatment of chronic neuropsychiatric conditions. For example, in a study of 1,472 Swedish individuals of European ancestry, those with a CYP2C19 PM genotype had significantly lower levels of depressive symptoms than an EM cohort. These authors concluded that additional studies are needed to establish the functional link between the P450 enzyme, CYP2C19 and depressive symptoms. On the other hand, from a pharmacogenomics standpoint, one can speculate that a lack of these enzymes (CYP2D6 and CYP2C19) could lead to adverse reactions and even fatality. Forensic autopsy studies, however, have demonstrated the contrary. Correlation of deaths due to suicide (n=262), and fatal intoxication (n=242), as compared to natural causes (n=212) was found to arise from the presence of two or more active CYP2D6 genes corresponding to the UM genotype, but was not demonstrated in PMs. Another group explored the possible link between UMs, depressive episodes, and indications of suicidality in a cohort of 285 inpatients experiencing an episode of either unipolar or bipolar depression. These authors confirmed the study by Zackrisson et al that concluded there was no association between UM status and baseline Hamilton Depression Rating Scale (HAM-D) scores, but that duplication of the CYP2D6 genotype had a specific effect on suicidality. The logistic regression remained significant, even after inclusion of covariates that might affect the depression scores (gender, baseline score of HAM-D after exclusion of Item 3 for suicidality, number of previous depressive episodes, ethnic group, and study center). Depression or depressive symptoms, therefore, overall appear to be independent of the effect of SNP metabolism on suicides. This leads to the consideration of a possible association between SNPs and personality traits. The relationship between CYP2D6 metabolic capacity (hydroxylation) and personality traits was studied using the Karolinska Scale of Personality (KSP) in 253 university students and staff from Havana Hospital and Calixto Garcia Medical School in Cuba. Debrisoquine hydroxylation capacity and CYP2D6 phenotypes (0, 1–2, and >2 alleles) were compared. A cluster of behaviors (e.g., anxiety, impulsivity) associated with personality features was related to the postulated reduction of serotonin in CYP2D6 PMs, further supporting the finding of increased risk of suicide attempts and completions linked to duplication and multiduplication of alleles (i.e., UMs, as more dependent on personality traits than on Axis I pathology. Biochemistry indicates that the two most common substrates, or enzymes (CYP2D6 and CYP2C19), are involved in the hydroxylation step of the biotransformation of precursor amino acids to neurotransmitters. However, the possibility of an additional role for CYP2D6 and CYP2C19 as catalysts through the process of O-demethylation in the serotonin-melatonin cycle is evidenced by regeneration of serotonin from 5-methoxytryptamine by polymorphic human CYP2D6. The lack of CYP2D6 in PMs was postulated to be the probable cause of significant anxiety and fear in certain personalities specifically when compared to extensive metabolizers. If a lack of serotonin is associated with PMs in the serotonin-melatonin cycle, the possible explanation for the association of UMs with suicide would be excessive production of serotonin as opposed to rapid depletion of it by metabolism. It is clear from the above discussion that SNPs and their involvement in biochemical processes are not site- or reaction-specific (i.e., at hydroxylation or O-demethylation stages only), but might involve decarboxylation and transamination reactions as well. This might explain the rapid disappearance of neurotransmitters from reuptake sites and the lack of therapeutic response to psychotropic medications dispensed in otherwise acceptable therapeutic dose ranges in the 10 percent of Caucasians who represent PMs. Exogenous factors such as antidepressants, antipsychotics, and mood stabilizers further complicate the pre-existing SNP profile by acting as inhibitors and inducers of these P450 enzymes. In summary, the exact mechanisms or functionality of SNPs are mostly unknown, considering the complexity of pharmacokinetic, pharmacodynamic, inter-individual, and inter-ethnic challenges in assessment. However, broader implications of the involvement of SNPs in the diagnosis and treatment of conditions such as colon cancer and other cancers are encouraging. Available statistical data reveal that 25 percent of the medications prescribed today are metabolized by CYP2D6 enzymes. Approximately, 5 to 10 percent of the Caucasian population are poor metabolizers of CYP2D6, and 3 to 5 percent for CYP2C19. Almost 98 percent of the CYP2D6 poor metabolizers can be identified and confirmed by genotyping alone and the number is higher for CYP2C19 PMs. On the contrary, only 20 percent of ultra-rapid metabolizers can be identified by genotyping. 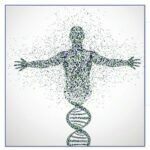 Most importantly, CYP2D6 is a unique, non-inducible enzyme, giving it the advantage of being specific to drug metabolism; thus, phenotypic variability carries enormous diagnostic potential that could lead to better treatment outcomes. And not surprisingly, combined high CYP2D6-CYP2C19 metabolic capacity is associated with the severity of suicide attempt as measured by objective circumstances. Point of care testing (POC) with immediately available results becomes more important, especially in young adults in whom an escalation in the number and severity of self-destructive behaviors is increasingly associated with fatal outcomes. Other populations of concern would be the active duty military and veterans where suicides are also steadily rising and warrant close monitoring and predictive testing when available. At the very least, it behooves us as clinicians and scientists to further explore and clearly establish the relationship between SNPs and suicidal behaviors. The views expressed here are solely those of the authors and are not to be construed as official or representing those of the Department of the Army or the Department of Defense. Ingelman-Sundberg M, Persson A, Jukic MM. Polymorphic expression of CYP2C19 and CYP2D6 in the developing and adult human brain causing variability in cognition, risk for depression and suicide: the search for the endogenous substrates. Pharmacogenomics. 2014;15(15):1841–1844. Sankararaman S, Mallick S, Dannemann M, et al. The genomic landscape of Neanderthal ancestry in present-day humans. Nature. 2014;507(7492):354–357. Ferugson CS, Tyndale RF. 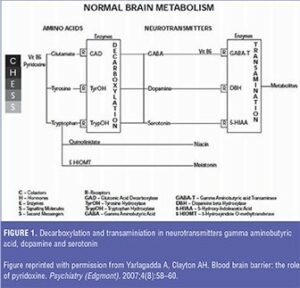 Cytochrome P450 enzymes in the brain: emerging evidence of biological significance. Trends Pharmacol Sci. 2011;32(12):708–714. Yarlagadda A, Clayton AH. Blood brain barrier: the role of pyridoxine. Psychiatry (Edgmont). 2007;4(8):58–60. Ingelman-Sundberg M, Sim SC, Gomez A, et al. Influence of cytochrome P450 polymorphisms on drug therapies: pharmacogenetic, pharmacoepigenetic and clinical aspects. Pharmacol Ther. 2007;116(3):496–5260. Rebsamen MC, Desmueles J, Daali Y. The AmpliChip CYP450 test: cytochrome P450 2D6 genotype assessment and phenotype prediction. Pharmacogenomics J. 2009;9(1):34–41. Desta Z, Zhao X, Shin JG, et al. Clinical significance of the cytochrome P450 2C19 genetic polymorphism. Clin Pharmacokinet. 2002;41(12):913–958. McClearn GE, Johansson B, Berg S, et al. Substantial genetic influence on cognitive abilities in twins 80 or more years old. Science. 1997;276(5318):1560–1563. Sim SC, Nordin L, Andersson TM, et al. Association between CYP2C19 polymorphism and depressive symptoms. American Journal of Medical Genetics. 2010;153B(6):1160–1166. Sara CS, Linn N, Andersson TM, et al. 2010. Association between CYP2C19 polymorphism and depressive symptoms. Am J Med Genet. Part B153B:1160–1166. Zackrisson AL, Lindblom B, Ahlner J. High frequency of occurrence of CYP2D6 gene duplication/multiduplication indicating ultrarapid metabolism among suicide cases. Clin Pharmacol Ther. 2010;88(3):354–359. Stingl JC, Vivaini R. CYP2D6 in the brain: impact on suicidality. Clin Pharmacol Ther. 2011;89(3):352–353. Gonzalez I, Penas-Lledo EM, Perez B, et al. Relation between CYP2D6 phenotype and genotype and personality in healthy volunteers. Pharmacogenomics. 2008;9(7):833–840. Yu AM, Idle JR, Byrd LG, et al. Regeneration of serotonin from 5-methoxytryptamine by polymorphic human CYP2D6. Pharmacogenetics. 2003;13(3):173–181. Travica S, Pors K, Loadman PM, et al. Colon cancer-specific cytochrome P450 2W1 converts duocarmycin analogues into potent tumor cytotoxins. Clin Cancer Res. 2013;19(11):2952–2961. Benet LZ, Kroetz DL, Sheiner LB. Pharmacokinetics. Goodman & Gilman’s the pharmacological basis of therapeutics. 9th ed. New York: McGraw Hill; 1996:3–27. Griese EU, Zanger UM, Brudermanns U, et al. Assessment of the predictive power of genotypes for the in-vivo catalytic function of CYP2D6 in a German population. Pharmacogenetics. 1998;8(1):15–26. Lazarou J, Pomeranz BH, Corey PN. Incidence of adverse drug reactions in hospitalized patients: a meta-analysis of prospective studies. JAMA. 1998;279(15):1200–1205. Penas-Lledo E, Guillaume S, Naranjo Me, et al. A combined high CYP2D6-CYP2C19 metabolic capacity is associated with the severity of suicide attempt as measured by objective circumstances. Pharmacogenomics. 2015;(2):172–176.